a. Not a creature will stir without permission. This includes warrant officers and mice. 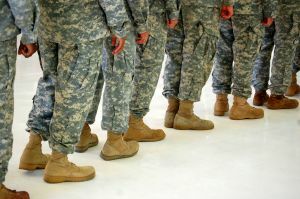 Soldiers may obtain special stirring permits for necessary administrative action through the Battalion S- Officer stirring permits must be obtained through the Deputy, Post Plans and Policy Office. d. Stockings, Wool, Cushion Sole, will be hung by the chimneys with care. Necessary safety precautions will be taken to avoid fires caused by carelessly hung stockings. 1SG's will submit stocking handling plans to S-3, Training prior to 0800 hours, 24 Dec. All leaders will ensure their subordinate personnel are briefed on the safety aspects of stocking hanging.c. Personnel will utilize standard "T" ration sugar plums for visions to dance through their heads. Sugar plums are available in "T" ration sundry packs and should be eaten with egg loaf, chopped ham, and spice cake to ensure maximum visions are experienced. e. At first [sign] of clatter, all personnel will spring from their beds to investigate and evaluate the cause. Immediate action will be taken to tear open the shutters and throw up the window sashes. On order OPLAN 7-01 (North Pole), para 6-8 (c)(3), dated 4 March, this office, takes effect to facilitate shutter tearing and sash throwing. SDO and all CQs will be familiar with procedures and are responsible for seeing that no shutters are torn or sashes thrown in Bldg 9828 prior to the start of official clatter. 2. LT JG Claus will initially enter Bldg 9828 through the dayroom. All offices without chimneys will draw Chimney Simulator, M6A2 for use during the visit. Draw chimney simulator on DA Form 2765-1 which will be submitted in four copies to the S-4 prior to 23 Dec. Personnel will ensure that chimneys are properly cleaned before turn- in at the conclusion of visit.